Megastar rapper Drake is denying reports that he engaged in a nightclub scuffle with Chris Brown over Rihanna, but both performers have met with police to discuss the incident. According to the Associated Press, representatives for Drake said that June 14 he was leaving W.i.P., a New York nightclub, when a brawl broke out between Brown and other revelers. 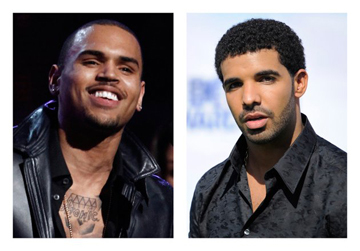 TMZ reported that Drake, Brown and their respective entourages traded blows June 13 resulting in several injuries and damage to the property. In a statement to the AP, Drake denied the claims. It is believed the fracas originated when Brown sent a bottle of champagne over to Drake’s table. Drake reportedly sent back a nasty message to Brown’s table before he walked over with his crew and punched Brown in the face. Reportedly, one of Drake’s companions then threw a bottle at Brown, initiating the clash. Five persons were injured in the fray, according to NYPD officers, who arrived after receiving a call between 4 a.m. and 5 a.m. Both Drake and Brown were absent when the police arrived. Later, Brown took to Twitter, posting a photo of his face, which showed a gash on his chin that he said came from a bottle. He also tweeted several taunts, writing, “How u party wit rich n**** that hate? Lol… Throwing bottles like girls? #shameonya!” and “Ok! N****s stand behind security! Ok! U don’t pay them enough.” Both posts were later removed. According to MTV, both men have been in communication with the NYPD about the incident, and neither is considered a suspect in the incident.